If you only had 24 hours to spend in Madison, what would you do? After making a recent move to Chicago, I was faced with exactly that question. I made a quick 24 hour stop in Madison before the holiday weekend and I had two items on my must-do list: beers at the terrace and lunch at a food cart. 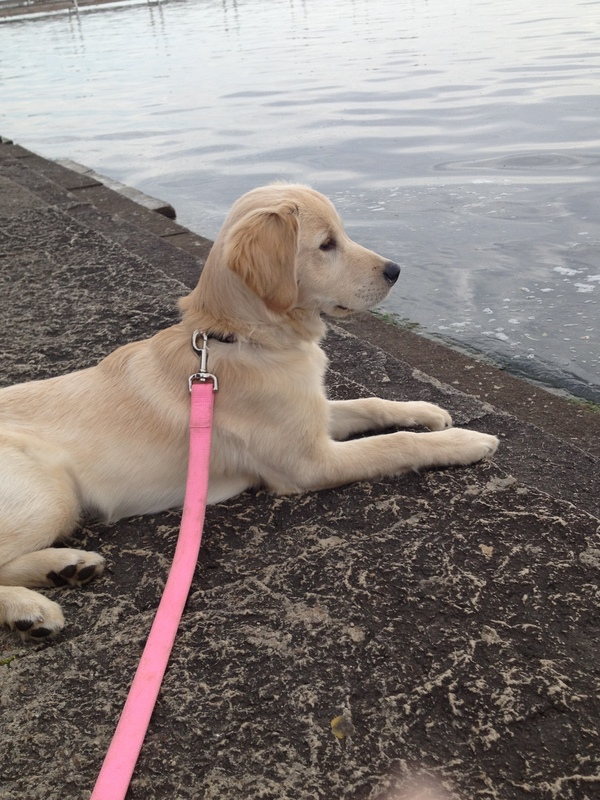 I also had a 5 month golden retriever pup to look after in the morning, so juggling the equivalent of a toddler in dog form was going to make my must-do list a little harder to complete, especially considering said pup seriously tried to eat EVERYTHING she found on the ground. Wrappers, grass, old Kleenex, leaves, sticks, cigarette butts, mulch, ROCKS (who tries to eat rocks? )…she saw it, she ate it. I digress. As lunch approached, I headed to Library Mall. I was a little disappointed at the lack of carts—perhaps it was due to the approaching holiday weekend, but the pickings were slim. I saw the Banzo cart and immediately wanted to try it due to Kailey’s rave review, but I also want to stay active on our blog so I chose a new spot that we hadn’t covered: Hibachi Hut. After maintaining this blog for two summers, how had we not reviewed Hibachi Hut? Better yet, how had I never eaten there? 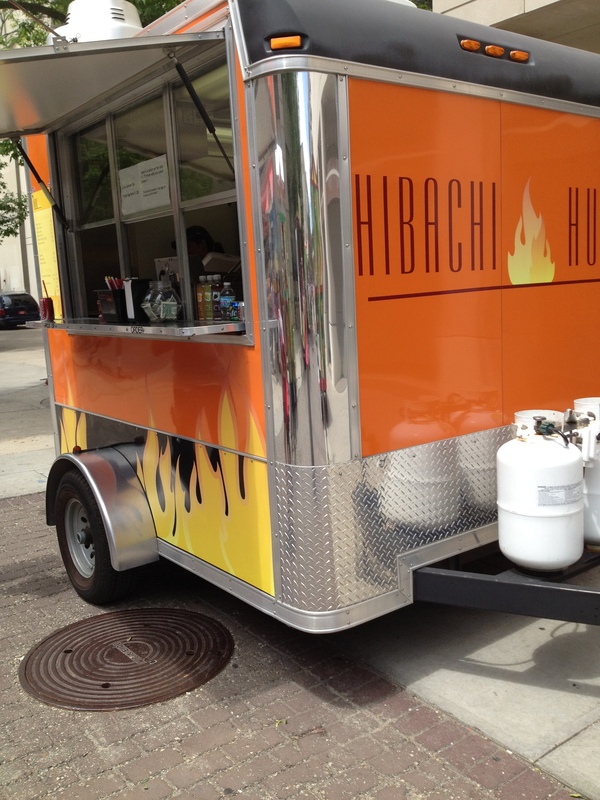 Every time I walk through Library Mall, the smells of Hibachi Hut overwhelm me and their bright orange metal covered cart screams EAT HERE. The combination of soy sauce, garlic, and other magic ingredients seem to mask any other scents coming from carts, yet that always kept me away because I somehow rationed with myself that I already knew what to expect from a hibachi cart. I guess I wanted to give the other guys a chance…until today. I stepped up to the cart and knew I had to go with the steak hibachi. There were probably 8 or 10 options on the menu, and for an extra $1.25 you could make your order a “meal” by adding 2 eggrolls and a drink (which I chose to do). In total, I paid $8.50 and got a healthy size portion for lunch. The steak was juicy, not dry, and the veggies weren’t soggy either. They prepare the hibachi while you wait, so it was comforting to know that the food hadn’t been sitting around all morning waiting to be served. The eggrolls were delicious too—the perfect size to accompany my meal. All in all, this lunch was very satisfying. I even had leftovers! 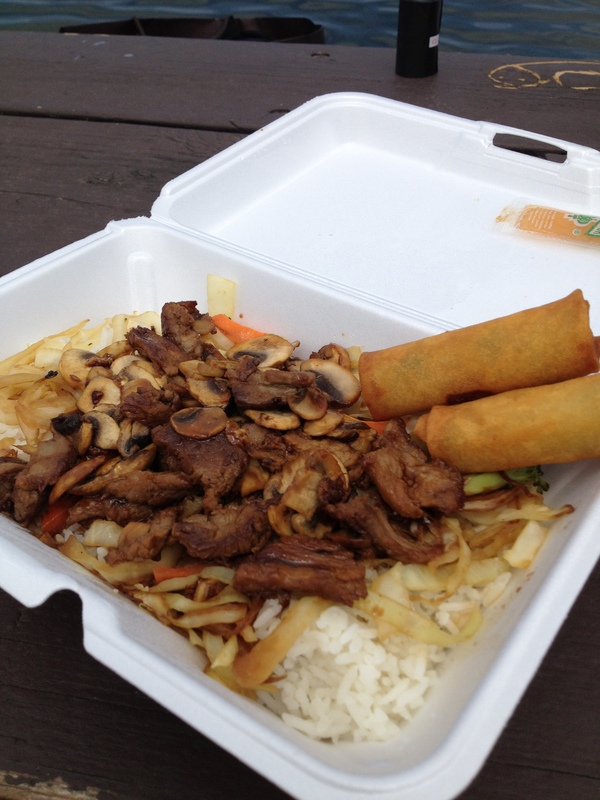 Hibachi Hut is one of a kind in the Madison food cart scene–there is plenty of Asian fare, but none prepared on a hibachi grill while you wait. If anything, this cart is definitely one I’ll consider an “old faithful” if I’m in a pinch and can’t decide which food cart to go to. Wandering aimlessly among food carts when you’re hungry isn’t always the best of ideas. It’s like the rule my mom makes about going to the grocery store hungry. The rule is, DON’T DO IT, because you’ll end up buying bulk size bags of sour cream and onion chips, a bucket of hot wings and those little pretzel stick & cheese cup combo packs. This time though, as Stephanie and I roamed through the street food carts on MLK Drive, our noses didn’t mislead us. We were considering the Sante Fe cart for some tex-mex, but as we hovered over the menu a scent hit our noses. The smell was an irresistible, my-mouth-is-watering-just-thinking-about-it, tangy barbecue smell coming from Teriyaki Samurai. We saw no reason not to give into temptation, so we stepped up to order. And, unlike other confusing carts, there’s only one window at the Samurai where you both order and pick up. 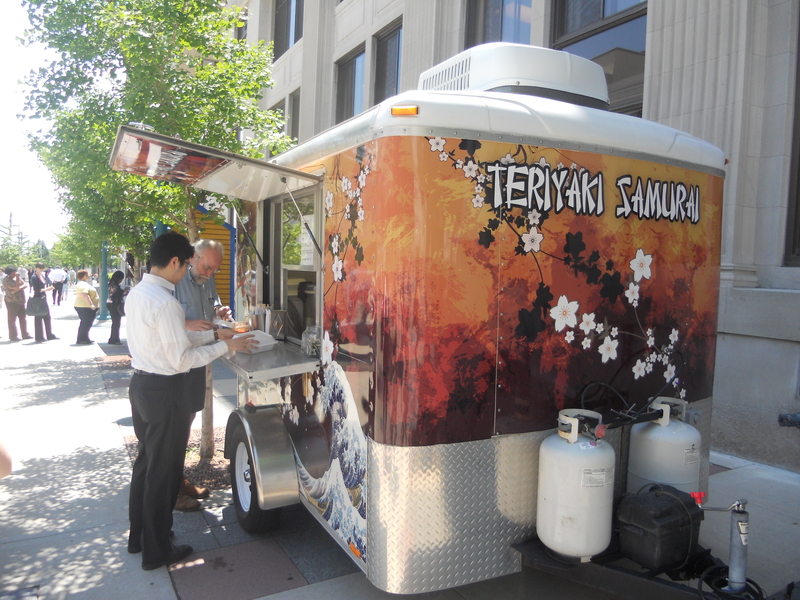 The Samurai himself takes your order and quickly works to prepare it–there is no lack of hustle in this food cart! I went with the hibachi chicken and Steph stuck with the cart’s signature, teriyaki chicken. 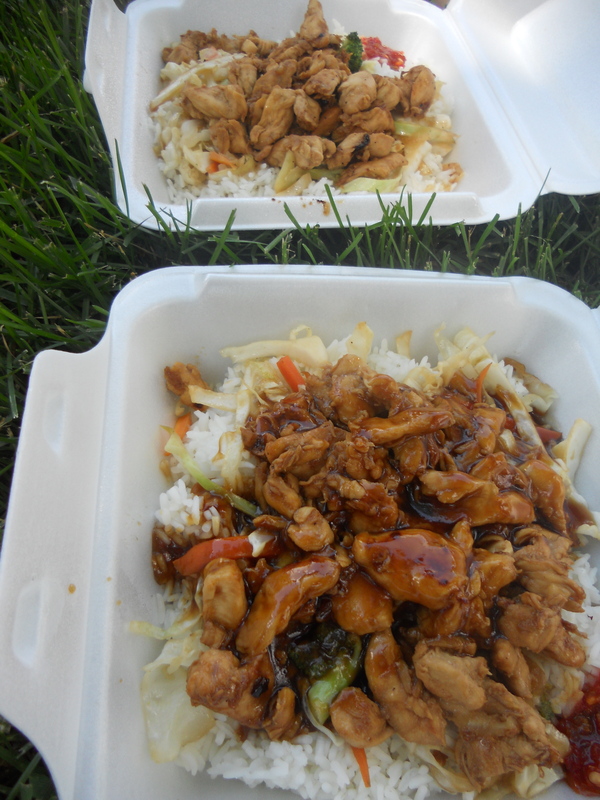 The difference between the two is the sauce–the hibachi chicken had been marinated in some delicious sounding soy-sauce mixture, and the teriyaki chicken has more of a sauce on top. Both smelled (and looked) equally delicious. Having spent too long in Nepal where chicken is served on the bone, I was overjoyed at seeing a heaping pile of saucy chicken with no bones. The taste absolutely matched the delicious smell we’d so astutely followed, and neither of us were disappointed. The veggies were probably previously frozen — they were no highlight. My months spent in a rice loving country hasn’t left me too keen on rice, but there was enough of it (ah, isn’t there always?) and it was sticky enough to eat with my chopsticks. There was a spicy sauce available to put on your dish, which we both chose. The spice added a nice kick and a little bit of a post-bite zing in the mouth, which showcased the flavors of the chicken quite well.Although they don’t have many items on the menu (which I can appreciate because they definitely stick to what they’re good at), the prices are pretty decent. We each paid $5.75 for our chicken dishes, and could’ve paid $1 more to upgrade to steak. Besides the hibachi and teriyaki options, they had a curry chicken dish and vegetarian combo plate as well, both of which seemed quite underwhelming compared to the main star dishes we decided on. If you go: get the Teriyaki, I was jealous of Steph’s chicken. And don’t be afraid to add the spicy sauce, it’s good for your health. 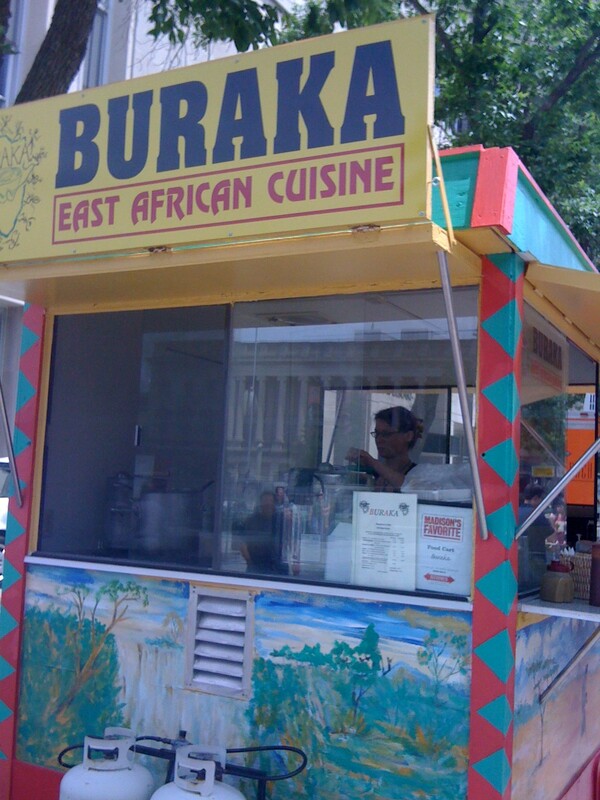 I’m ashamed to say that I’ve never been to Buraka on State Street–I’m always nervous to try new places due to fear of the unknown…even though I’ll try just about anything once. Strangely enough though, I’m more apt to try new foods at a food cart. Maybe it’s because I’m not tied down to sitting in a restaurant, therefore making it ok if I don’t like my food? Maybe it’s because it’s less expensive than a restaurant so the risk ratio is lower? Who knows. Either way, I had my sights set on Buraka today to try something new. With 8 menu items to choose from, my stomach was overwhelmed. The line was a little long though, so I had extra time to decide. I noticed that immediately after an order is placed, you are served your food. This avoids the potentially awkward situation standing around in front of people who are trying to order their food while waiting for yours…I feel like this happens to me often at food carts. Everything is available in either a half or full portion, and you even have the option to combine dishes if you can’t decide on just one, which I thought was great. Each item is served with your choice of either rice or injera, a homemade Ethiopian flat sourdough bread. 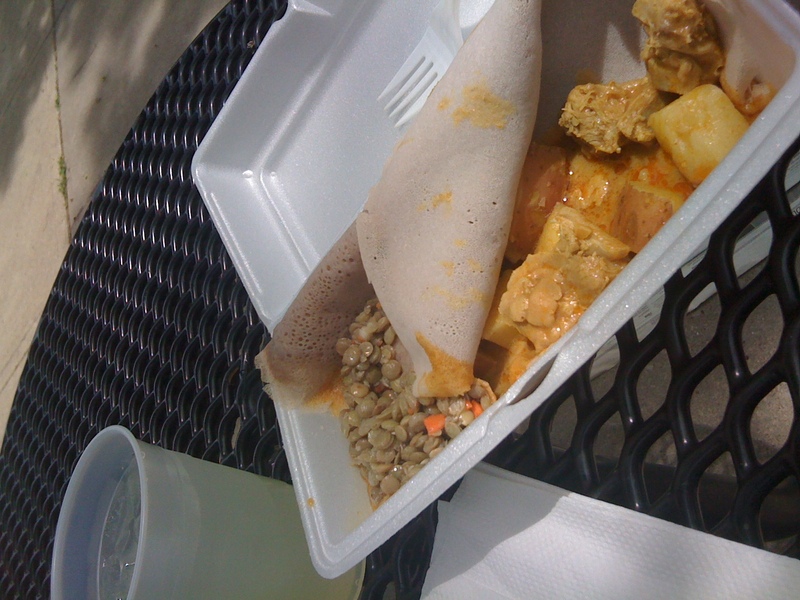 I decided on the chicken peanut stew with the injera–it came with a small cold lentil salad on the side, too. I splurged on a lemonade for good measure. Everything together was $7. I opened up my styrofoam box and was pleasantly surprised. The stew was basic: chicken and red potatoes in a brown peanut sauce. It was served on top of the injera–the injera itself is a strange thing. It wasn’t what I was expecting to receive…it was spongy and light and didn’t really resemble bread, but still had a nice flavor. The flatbread was a great pair with the stew because it absorbed the liquid along with flavor, so it was great to use to sop up the tasty extras at the end. There was a perfect ratio of chicken to potatoes, and each were cooked evenly. The peanut sauce was a little spicy (I am a weakling when it comes to spicy things, so it probably wasn’t that bad), but the cold lentil salad was perfect to counteract the spices and my runny nose. I ate every last bit of this dish and plan on hitting the real restaurant in the near future to sample their other yummy dishes! 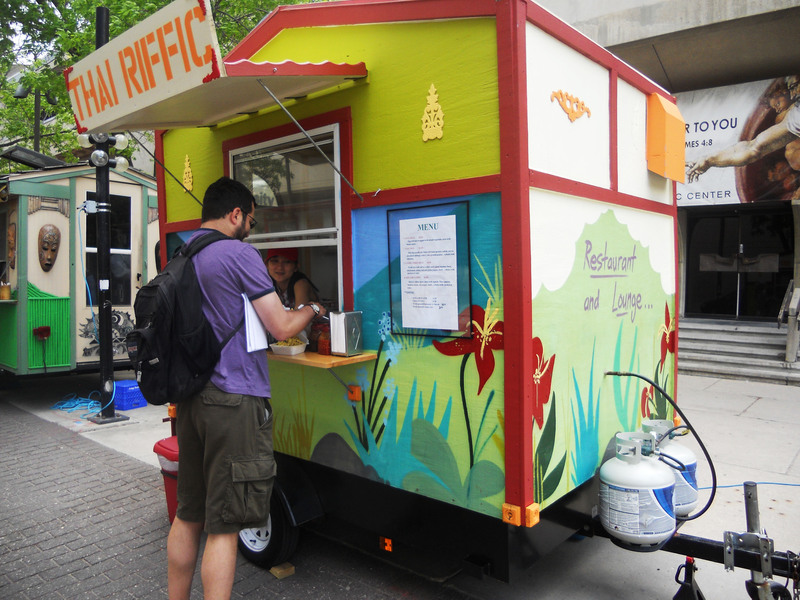 I would highly recommend this to anyone looking to try something new from a food cart! 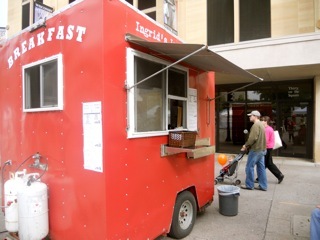 I had a bite of Ingrid’s at last year’s farmer’s market. I remember my mouth being overwhelmed with joy, so I was looking forward to going back. There was a little bit of a line, but I figured my crêpe would be worth the wait (and I was right!). With 9 menu items to choose from, I had a hard time deciding what I wanted. Should I get the customizable farmer’s crêpe (I planned on getting it with swiss, asparagus and mushrooms), the fresh fruit crêpe, or the banana nutella crêpe? So many delicious choices!! I went with the fresh fruit crêpe–the sweet summery tastes of fruit sounded extremely appealing despite the overcast, un-summery weather. It included a sweet crêpe filled with strawberries, pineapple, and real heavy whipped cream, topped with a crème fraîche (a rich cream with a nutty, slightly sour taste and a velvety texture). I paid $6 for my food but had to wait about 5 minutes. There was a huge line with lots of other people waiting for their food as well, so I figured if it was this popular I was making a good choice for breakfast. I was handed a paper plate with a HUGE crêpe on it wrapped in insulated foil (comically labeled ‘cheeseburger’) with a plastic fork. I didn’t really know how to go about eating the thing–do I eat it burrito style with my hands? Do I attempt to cut off chunks with my puney fork? I chose the latter. 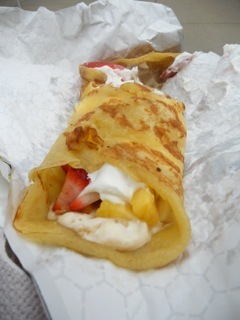 The first bite with a mix of crêpe, the sweet bite of strawberries and pineapple enveloped in the whipped creme and crème fraîche was heavenly. It’s funny how food can evoke feelings when you eat it. My breakfast just made me feel downright happy. Happy to be eating, happy to be at the farmer’s market, happy about life. I was just a very happy girl! I’m a big fan of Thai food. It’s usually my ethic food of choice when I order out, so I was naturally drawn to this cart. With only 4 menu options I felt a little limited, but everything on the menu was familiar so I figured I couldn’t go wrong. After wavering back and forth between Pad Thai and Curry Fried Rice, I went for the Pad Thai. I’m always a sucker for the bold peanut flavors in Thai food and I was craving just that, so I was excited to get my peanut fix. The woman in front of me ordered a bright orange iced drink–I was intrigued. She said it was Thai iced tea and that it was “really really good”, so I trusted my fellow food cart eater and decided to splurge and get that as well. I opened up my styrofoam carton and was happy with the amount of noodles I had–the pile was heaping! 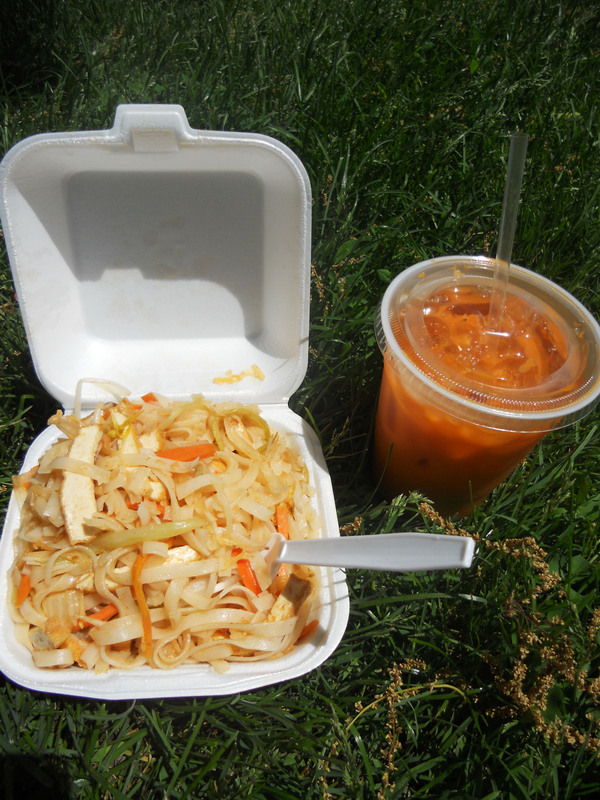 I paid $6 for my Pad Thai and $2 for my Thai iced tea and barely had to wait 2 minutes! I was impressed thus far. I got lunch with Megan (she had Surco Peruvian) so we took a sunny spot on Bascom Hill and started eating. I have to admit, at first bite I was happy, but the more I ate the more disappointed I got. There was no peanut-y flavor like the menu had promised (and I had hoped); the noodles were kind of bland and the veggies were barely prominent in the dish. The Pad Thai also came with tofu (which I like and there was plenty of), but it hadn’t taken on any flavors in the dish so it was pretty bland as well. It was also apparent that the Pad Thai was pre-made (which was a bummer since I thought that most carts would make things like this to order) but while waiting for my food I saw a huge pile of ready-to-serve Pad Thai sitting just inside the cart. I thought that perhaps the Thai iced tea would redeem my meal, but it didn’t. I’m always open to new flavors, but this is one I wouldn’t get again. The bright orange iced tea was extremely sweet, and even though I love sweet stuff, my iced tea tasted like a weird candy. I couldn’t drink any more after I had barely finished 1/3 of the glass so I had to throw it away. In the end, after eating for about 20 minutes and pretty much finishing my food, I felt kind of full and not satisfied. I decided to go get a smoothie to top off my meal so I could redeem myself just a little. Since I really do enjoy Thai food, I’d give Thai Riffic another shot, but I don’t think I’d get the Pad Thai again.